A new METALLICA album is finally going to see the light of day! Entitled Hardwired…To Self-Destruct, the new studio album from the legendary thrashers will be released on November 18th and will be a 2CD set with almost 80 minutes of music. In addition, a video has been released for the album’s lead track and first single, “Hardwired”, and you can check it out now on KNAC.COM right HERE. In less than 24 hours the video has already racked up nearly 2 million views! “Hardwired… represents the next phase of our journey as METALLICA and we are so excited to share it with you. If anyone was tuned into radio station 93X in Minneapolis earlier today, you heard the world debut of the first track, “Hardwired”Greg Fidelman, along with James and Lars, this is our 11th studio album and is available for pre-order in a variety of configurations including 12 songs on a double CD, vinyl, digital download, as well as a deluxe version with the riffs that were the origins of the album. 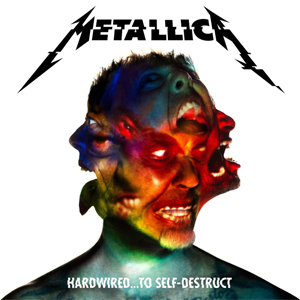 Everyone who pre-orders the album through Metallica.com will receive an instant download of the song “Hardwired”.